I can’t think of an easier way to prepare a Thanksgiving turkey than to smoke it low and slow. You can do this outside in your Masterbuilt Electric Smoker in any weather. This frees up the kitchen oven for dishes you need to bake or just keep warm. You can also smoke some great sides and even desserts. 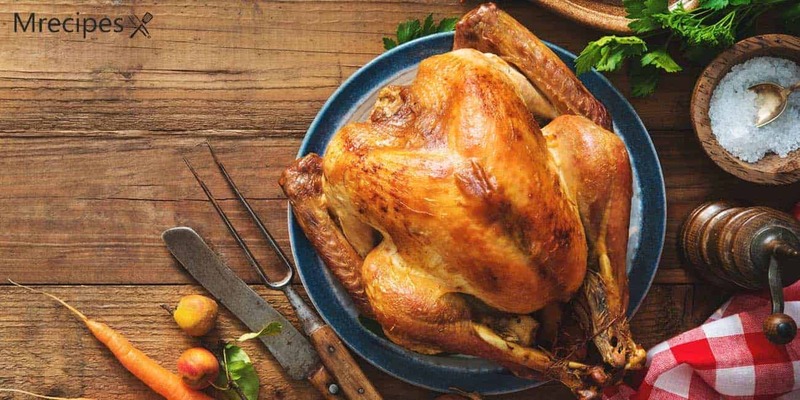 You can brine your turkey in a bath of water and equal parts salt and sugar the night before. I don’t do that because I find the turkey retains too much of the salt. As well, I have to do it in a large cooler with ice water that I leave outside because my refrigerator just doesn’t have enough room. If the weather is a bit on the warm side I have to nurse the bath every few hours to keep it cool enough. Frankly, it is just more work than I need the day and night before the big meal. You can buy a pre-brined turkey. I don’t recommend that because you never know how long the turkey has been sitting in the solution. I bought a pre-brined turkey only once and it was a salt bomb. Make sure you ask the grocer’s meat department the date the turkey was packaged if you go this route. To be honest, I prefer fresh, organic, free range turkey meat. It is lean and extremely flavorful. The meat is a little more on the muscular, dark side. You will easily pay double for this type of turkey, so go with what your budget can handle. I splurge once a year for a high quality bird. But, a name brand, frozen turkey is fine. The recipes here are for smoked turkey and a couple of Thanksgiving sides. While my recipe doesn’t call for brining, you can still use a brined turkey for this recipe without modification. Make sure you purchase a turkey that is sized appropriately for your smoker. 12 to 14 pounds is generally a good rule of thumb. You can always smoke 2 smaller turkeys. You must completely thaw the turkey in advance, if you purchase it frozen. Place the packaged bird in a large pan in the refrigerator. It can take 2 to 3, even up to 5, days to completely thaw. I don’t recommend thawing the turkey on your kitchen counter. However, you can leave the turkey out of the refrigerator for up to 2 hours to bring it to room temperature before smoking. While this may sound ridiculous, remember to remove the bag of giblets and neck from the cavity. Use these to make an awesome stock for giblet gravy. I like to rinse my bird under cool water and then pat it dry. This is especially important with a brined turkey. If you do this, wear surgical gloves and be sure to wipe down the sink completely with hot soapy water, or even a little bleach. You don’t want to cross contaminate any surface or yourself with raw turkey juices. I have tweaked my traditional smoked turkey recipe to include some fruits and vegetables in the cavity. This is what I do when roasting in the oven. It accomplishes 2 things. It prevents the bird from shrinking by collapsing inward a bit. It also imparts a lot more flavor and moisture. The stuffing can simply be removed and tossed after smoking. The apple, onion, and citrus will be soft and fatty – not very useful. 1. Line a drip pan (cookie sheet or similar with a raised edge to hold the drippings) and water bowl with aluminum foil for easier cleanup. Preheat the smoker to 225˚F. 2. In a small bowl, cream together the EVOO and softened butter. Mix in the garlic, herbs, and spices. 3. Rub the interior cavity of the turkey with 1/3 of this mixture. Stuff the cavity with the fruits and onion. Rub the outside of the bird with the remaining fat and herb blend. 4. Place the water and apple cider to fill the water pan half way. Place the drip pan on the next rack just above the water pan to collect drippings from the turkey. Fill the side tray with the wood chips. 5. Tuck the tips of the wings tightly beneath the turkey. Place the seasoned turkey directly on the middle rack of the smoker. Insert the digital thermometer into the thigh of the bird, if your smoker has one. Set a timer for approximately 6.5 hours. A turkey generally smokes for 30 to 40 minutes per pound. You want to achieve an inside temperature of 165˚F. 6. Check the vent every hour for smoke. Add more wood chips if the smoke has died down. Also, check the water pan and add addition cider and water as needed. Start checking the internal temperature of the bird after 3 or 4 hours and every 45 minutes thereafter with either the digital thermometer or a good meat thermometer. 7. Remove the cooked turkey to a cutting board and allow it to rest for a minimum of 20 minutes before carving. You can tent it with aluminum foil to keep more moisture in. Gravy is like art. It has never come out the same way twice because it requires some simple nurturing and a bit of gut feeling. This is not so much an exact recipe as it is a gravy that evolves using your sense of taste and a feeling for the right texture. Here are the steps. 1. While the bird is smoking, place the neck and giblets in a soup pot with water to cover by about double. Bring to a boil, lower the heat, and allow this to slowly simmer for approximately 1 hour. Strain the liquid into a large glass measuring cup or bowl and set it aside. Don’t wash the pot because you will reuse it. 2. Take the cooked liver, heart, and kidneys and dice them up very small. Set these aside. The neck is somewhat hard to deal with because of the tiny bones. 3. While the turkey is resting, pour the drippings from the pan in the smoker into a heat proof measuring cup. Make a mental note of the quantity. Place the drippings into the empty soup pot and simmer over low heat. Add basic white flour, or any flour that you best tolerate, in a quantity that is equal to the amount of pan drippings. You can eyeball this. Whisk it into the pan drippings until it forms a really smooth roux or paste. 4. If inclined, whisk in about 1/4 cup of any drinkable wine, Marsala, or sherry. Allow the alcohol to cook down until the gravy is thick again. 5. Slowly whisk in the giblet broth a ladle full at a time until the mixture is a gravy consistency. Add in the giblets. Season the gravy with salt and pepper to your liking. If the mixture is just too thick or pasty, add some cream or extra broth to thin it out. You can smoke almost any vegetable successfully. I am a big fan of smoked russet and sweet potatoes, which you can do on the top rack during the last 2 to 3 hours of the turkey smoking. I also like smoked green beans and Brussels sprouts for Thanksgiving. And, smoked macaroni and cheese is always a crowd pleaser, especially with the kids. You can check out some great smoker recipes for vegetables, fruits, nuts, and herbs here. Here are a couple of my favorite holiday sides. 1. Wash the potatoes very well, removing any eyes. No need to peel them. Poke a couple of holes in them with a fork to allow for steam to escape. Brush the potatoes with olive oil and coat with some sea salt. 2. After 3 to 4 hours of smoking your turkey, place the whole potatoes directly on the top rack of your smoker above the turkey. Cook them until they begin to feel soft and start to release some juices. This will take anywhere from 2 to 3 hours. 3. Serve the whole potatoes with butter, salt, and pepper. Alternatively, remove the skins and mash them with a little butter, heavy cream, maple syrup, sea salt, and ground nutmeg for a semi-sweet side. 1. Bring a 4 quart pot of water to a boil. Add 1 teaspoon of the salt. Cook the macaroni in the salted water as directed on the box, approximately 6 to 8 minutes so that it is still slightly al dente. While the pasta is cooking, grate the cheese. Drain the pasta. 2. In the same pot, melt 6 tablespoons of the butter. Whisk in the flour a little at a time until it is well blended with the butter. Cook this roux down for approximately 2 minutes until pasty and smooth. In another pot, heat the milk until just warm. Do not boil the milk. 3. Add the warm milk, 1 cup at a time into the roux, whisking continuously. Cook this for 2 minutes until just creamy and starting to thicken. 4. Remove the pot from the heat and stir in the cheeses, nutmeg, salt, and pepper. Gently add the macaroni to coat it. Pour this mixture into the roasting pan. 5. In a sauté pan, melt 2 tablespoons of butter with the remaining salt. Stir in the breadcrumbs to coat with the salted butter. Place the breadcrumbs evenly over the macaroni. 6. Smoke for approximately 1 hour until the cheese is bubbling and the bread crumbs are toasted. Serve while it is still hot. I don’t normally have a sweet tooth, except when it comes to Thanksgiving. I think every Thanksgiving meal needs a combination of savory and sweet. I happen to love nuts. I have developed a recipe for smoked nuts that makes for the ultimate snack food. Smoked pecan pie takes nuts to a new level. I hadn’t thought of smoking a pie until recently. I have to give a shout out to the “From Calculus to Cupcakes” blog for the inspiration for this recipe. The recipe takes about 10 minutes to prepare and cooks for 1 hour and 15 minutes. Use a store bought pie crust to make life easier. 1. Line a metal pie plate with the prepared crust, or use a crust that is already in a pie plate. 2. In a large bowl, cream the butter and sugar together. Add the eggs and mix well. Stir in all the other ingredients and pour the mixture into the pie shell. 3. Place on the smoker while your turkey rests and while dinner is being enjoyed. Smoke for approximately 75 minutes until it is bubbly and hot. I absolutely LOVE this smoked pecan pie recipe. I’ve used it twice, and wil use it many more times. THe turkey tasted great, but was a little dry. We stitched the larger body cavity mostly shut, and the turkey seemed to take an extra 2 hours to reach 165 F in the thigh Our 14 lb turkey took 9:30 at 225 F. When the breast reached 168 F, I removed the turkey. When we carved the turkey (after a 30 minute rest), all of the meat was was done (nothing raw). I had never smoked a stuffed turkey before. I would like to re-try this recipe, but leaving the body cavities wide open. Also, as our guests started to arrive, I raised the temperature of smoker from 225 to 245 for the last hour. Probably not a smart thing to do.